With immigration reform a hotly debated topic, the past, present and future of immigrant entrepreneurship in the U.S. takes on new importance. A new exhibit at New York City's Tenement Museum offers the chance to explore the immigrant-owned small businesses that once occupied in the city's Lower East Side. The exhibit was the backdrop of an event yesterday for Etsy, a Brooklyn-based online marketplace for handmade goods, to tout its role in the New York City tech startup community. The company is just one of many showcased in "We Are Made in NY," a new campaign to promote entrepreneurship launched this week. The program celebrates more than 900 locally-based tech startups and aims to help people find jobs, learn tech skills, or launch new tech companies, with the support of the New York City government. The program is touted as a "one-stop shop" that aggregates the city's resources, including free technology classes, help with government contracts for women and minority-owned businesses, funding for early-stage startups, and support for immigrant entrepreneurs. Etsy CEO Chad Dickerson spoke at last night's event about his company's role in the New York City tech-startup community. 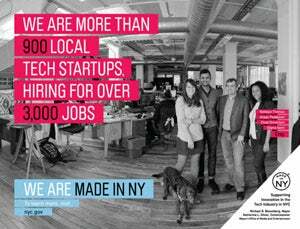 "New York tech companies have a huge advantage over tech companies anywhere else. Because as you can see in the street life here, New York represents a melting pot of different people, different nationalities, lots of different types of commerce, and in some ways I think New York is like the Internet itself," he said. "[Bringing together people from] all different walks of life." New York is home to 17,500 of the site's sellers and the site employs 300 in its office, located in the art-and-tech hub section of Brooklyn called DUMBO. New York state is second only to California in Etsy sales. The events attendees were taken on the museum's Shop Life tour which tells the stories of the merchants that had set up shop at 97 Orchard Street over the years. A re-created 1870's German beer saloon takes you inside the lives of the former owners John and Caroline Schneider, their contribution to the budding German-American neighborhood known at the time as Kleindeutschland, and their attempts at achieving the American dream. 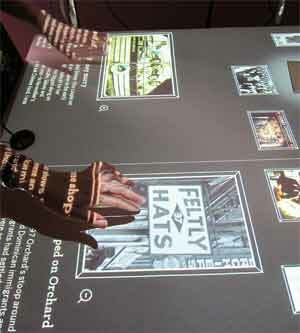 An "interactive sales counter" where visitors select artifacts is brought to life with audio and video clips. It explores the experiences of a 1902 kosher butcher shop owned by Israel and Goldie Lustgarten, a 1930s auctioneer named Max Marcus, and 1970s undergarment discounters Frances and Sidney Meda. And while the ethnic makeup and economic environment of the neighborhood has changed over the past nearly 150 years, the story of immigrant-owned small businesses continues. According to report conducted by the Fiscal Policy Institute, 48% of small businesses currently in New York City are owned by immigrants. The tour ends with a short video interview with one of today's immigrant entrepreneurs. The Shop Life tour is open to the public and given several times daily. Tickets are $25 for adults.